Crews have reopened the Ville-Marie Tunnel in downtown Montreal, less than a week after a concrete beam fell onto the road just outside the tunnel. 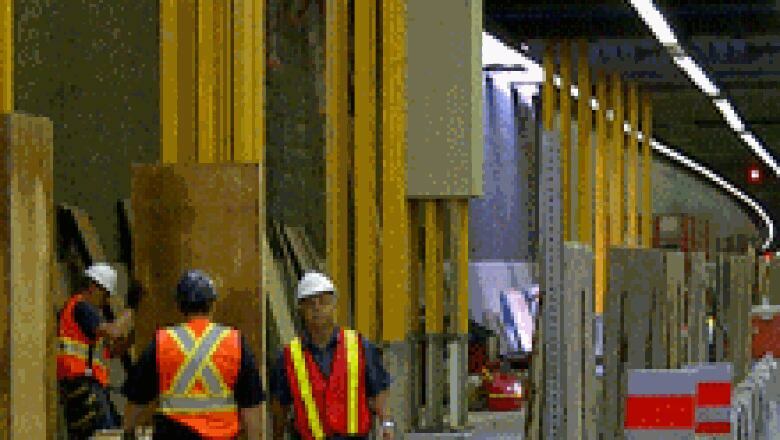 Crews have reopened the Ville-Marie Tunnel in downtown Montreal, less than a week after a concrete beam fell onto the road just outside the tunnel..
Nobody was injured in the mishap on the Ville-Marie expressway, which passes under the heart of the city. Transport Minister Sam Hamad said Friday that engineers were giving the tunnel a final inspection before reopening it. Hamad said with the construction holiday ending, his ministry is working to ensure the roads run smoothly. Once that goal is reached, he said he'll make major revisions to the way Transport Quebec handles problems with aging infrastructure. Quebec's transportation ministry is also expected to release a January 2011 report on the concrete grids covering one end of the tunnel. The piece that fell Sunday was one of those grids. Temporary support pillars were installed in the tunnel this week as a safety measure for workers. ((CBC/Raffy Boudjikanian))On Friday, Parti Québécois Leader Pauline Marois said the government must take part of the responsibility for the collapse. She accused the province of awarding contracts to private firms that did repair work she describes as questionable. But Quebec Transportation Minister Sam Hamad brushed aside the comments. He said the government is putting in place everything that's needed to keep its installations secure. Hamad has had a rough ride since last weekend's tunnel collapse. He was widely ridiculed for saying Quebecers should feel confident that a road is safe if it's open. Repairs scheduled for this weekend on the aging Champlain Bridge have been postponed. The corporation that manages the bridge said it's postponing repairs until next weekend because of bad weather in the forecast. Work will continue over the weekend on the Montreal side of the approach to the bridge on Highway 15, with some lane closures. 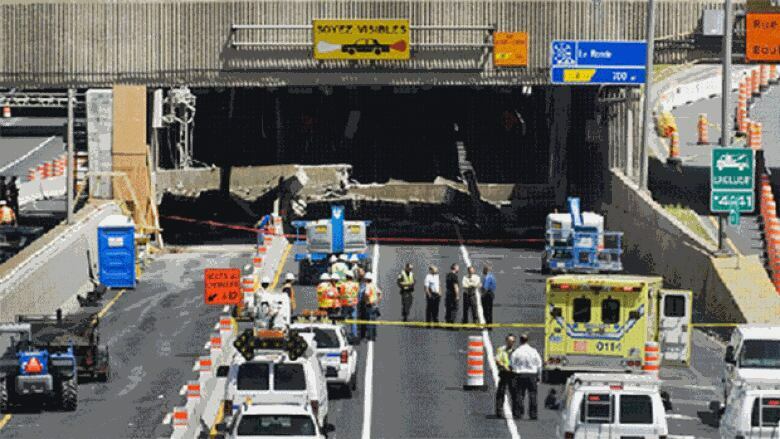 Drivers are advised to take the Bonaventure Expressway to access the bridge from Montreal.